Some of you might recall for Christmas, I was gifted some old wood flooring. It was determined that there was enough wood to lay in my dressing area. David thought it might be a fun project for us to do together. I hate projects. So, it soon became a David project, with me cheering him along. 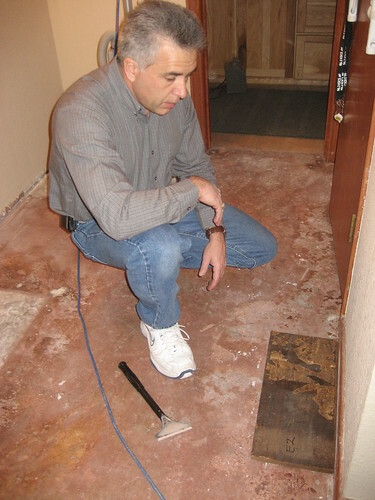 After ripping out the carpet and scraping the floor, David realized that to do this job right, the baseboards would have to come up, too. 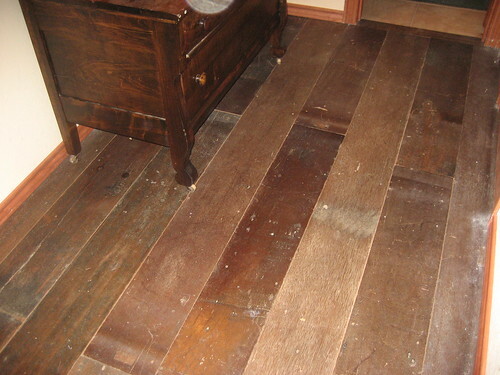 The wood planks are fairly thick. So, up the baseboards came. Somewhere around this time, I was reminding David how much I love him. Look! Baseboards back down. Planks flat and in place. Beautiful! Smooth ride? Ugh. It's March and he started in January. What do you think? Wood popped up in two different places. Humps were discovered in the concrete. Humidity happened. Boards were ripped up. Beer was consumed. 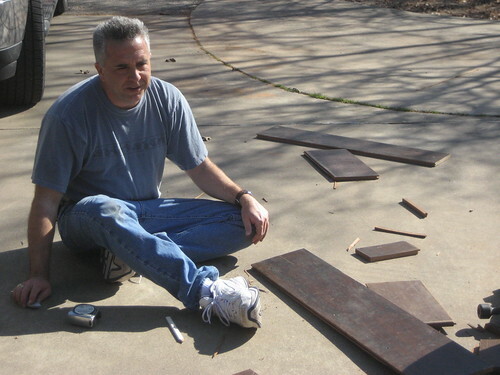 Boards were laid again. Concrete garden pavers were used for weights. Though I was not his helper, David did have a little helper. The floor looks great and David is smiling! What more could you ask? Who sent you Flat Stanley? 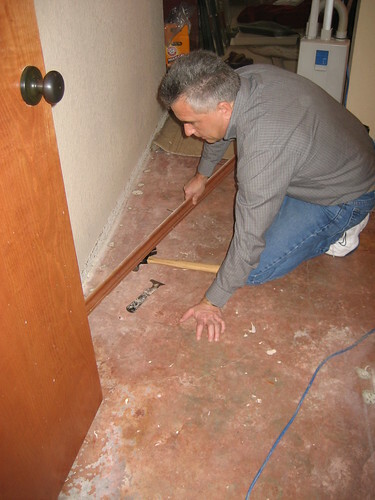 I have to laugh....hubby and I have laid many a wood floor over the past 10 years! It's a job!! 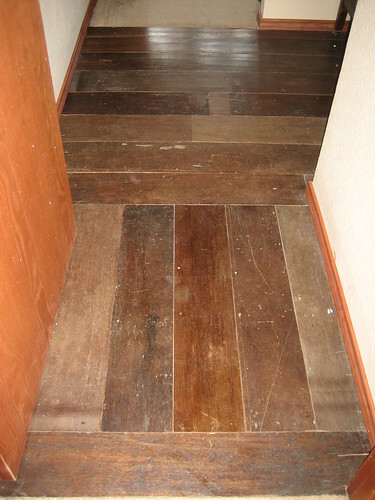 Love the wood floor! David would have had the smile the whole time had the list "started" with consumed beer. But such a nice feeling to have it done, right!? Way to go David!! It looks great and you're still smiling, so I'd say it was a success. 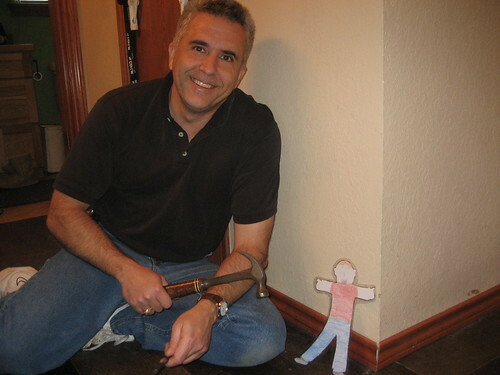 NIce work, David & Flat Stanley! You make a good team!! I laugh at how you love these old things, want them employed, but don't fancy the work. Once I thought I didn't mind the work but now I know differently. I like to cheer alongside, too, although my cheering sounds a little like bossing from time to time. Gorgeous floor though.